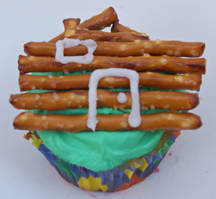 What better way to celebrate Presidents’ Day and honor the United States’ 16th president than with tasty log cabin cupcakes? That’s right: Easycupcakes.com even features cupcakes for Lincoln’s Birthday. And not just one cupcake design either. Oh, and if George Washington is your favorite, we have the cupcake for you coming up soon. What You Need: 1 cupcake (baked and cooled); green frosting; slim stick pretzels; white writing icing or white icing in pastry bag with medium round tip (we used #5). How to Make It: Frost cupcake. Immediately arrange pretzels in log cabin shape, breaking pieces to form room and chimney. Pipe white door and window. Have fun; be creative. This entry was posted on Sunday, February 17th, 2008 at 9:32 pm	and is filed under miscellaneous cupcakes, other holiday cupcakes. You can follow any responses to this entry through the RSS 2.0 feed. Responses are currently closed, but you can trackback from your own site.